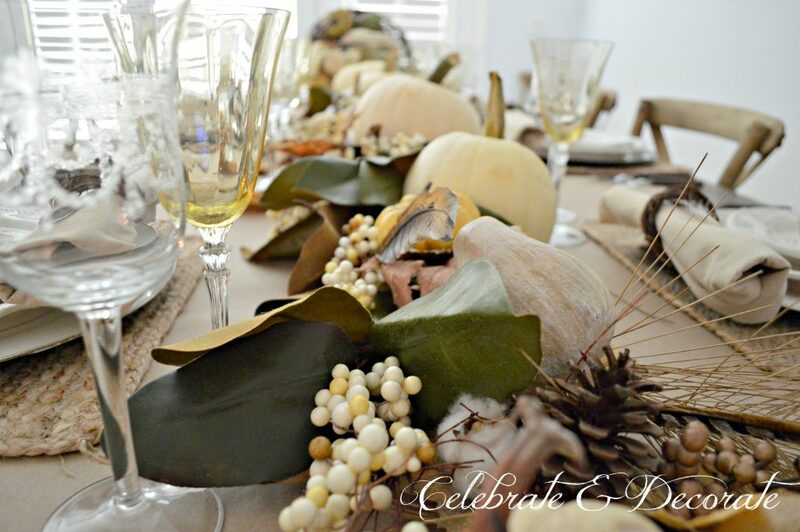 I am so happy to be joining 18 other tablescape bloggers this week to share our Thanksgiving Tablescapes. 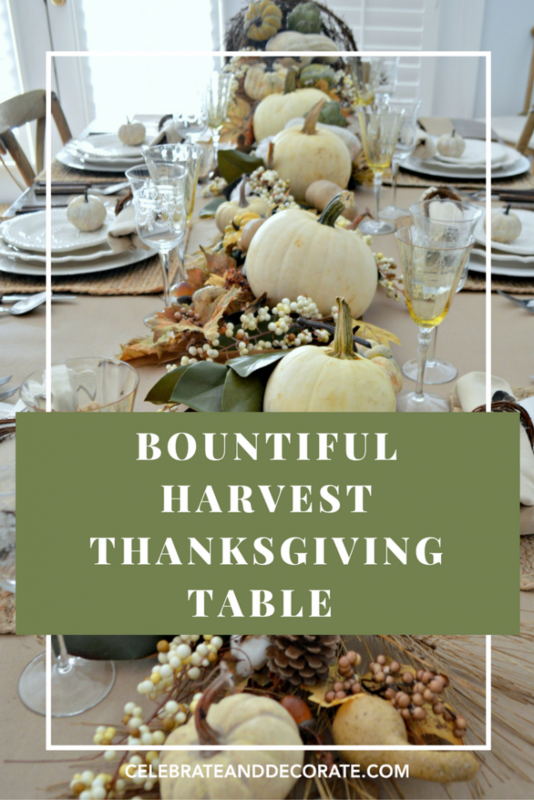 I chose to style my table as a bountiful harvest Thanksgiving table, with the harvest flowing from a grapevine crafted cornucopia. 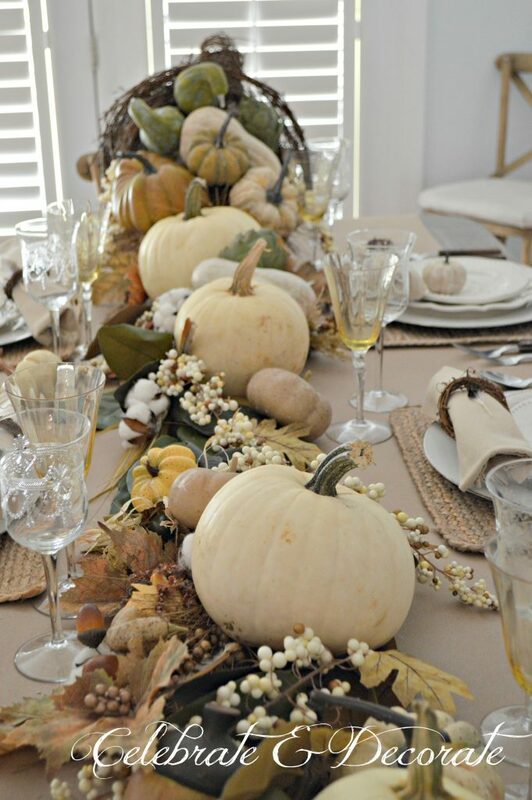 When I think about a Thanksgiving tablescape I always think about the harvest and imagine a table piled high with pumpkins and gourds, corn and wheat. I know this is a fantasy idea, but I wanted to take a cornucopia and have it flow down the length of my table. I think this fantasy table would be colorful with orange pumpkins, yellow wheat, green gourds and colorful Indian corn. I decided to keep my table much more neutral than that with shades of white, cream and tan. 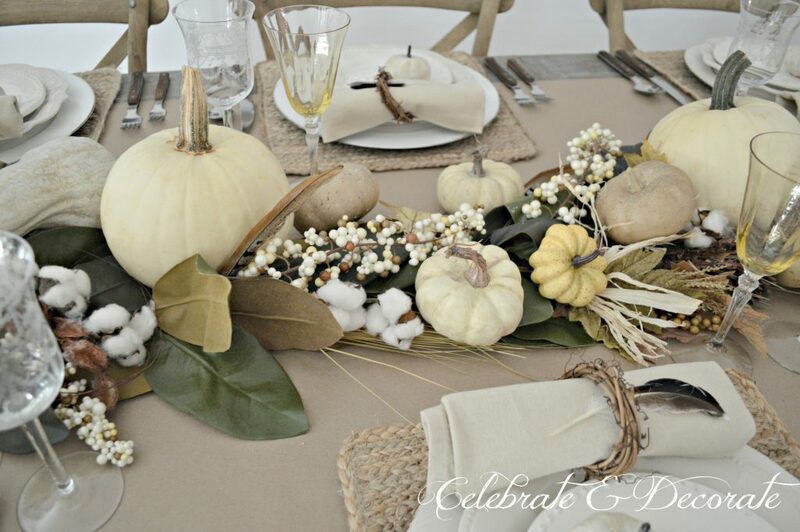 I began with with a brown paper runner down the center of my table and added jute placemats for a neutral colored table that had a variety of textures. I topped these with a white wood grain charger and added a cream dinner plate with a pretty fluted edge. These are from the Pioneer Woman Collection at Walmart. I found the white salad plates embossed with pumpkins at Hobby Lobby. 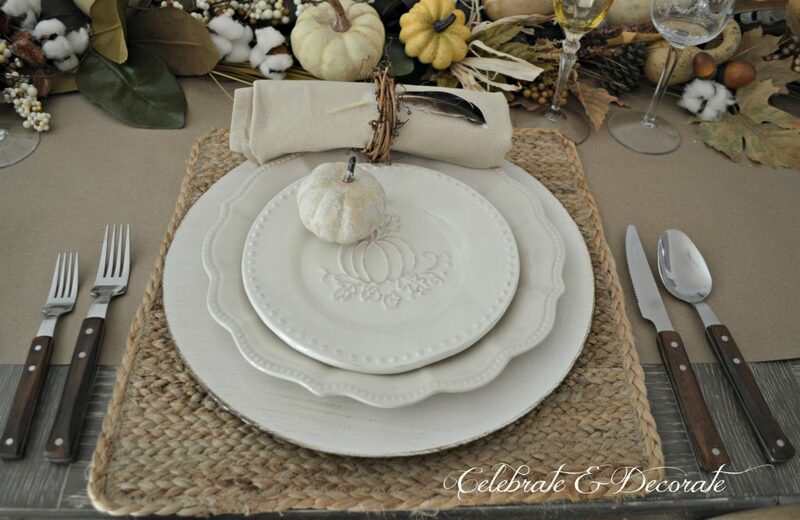 Each place setting was topped with a little whitewashed pumpkin. I should use these for place cards, but I really need to work on my hand lettering! 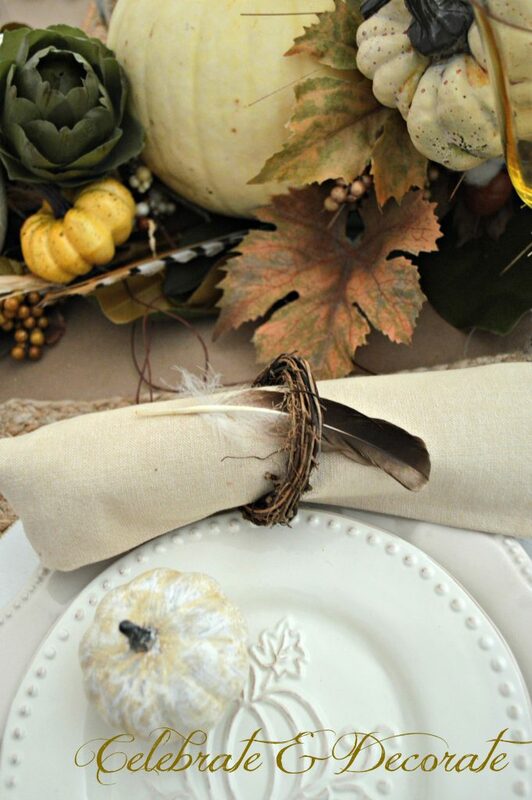 Neutral napkins were rolled and tucked into tiny grapevine wreaths with a little feather added for a bit more detail. I fashioned a cornucopia of grapevine by wrapping it around a frame of chicken wire. 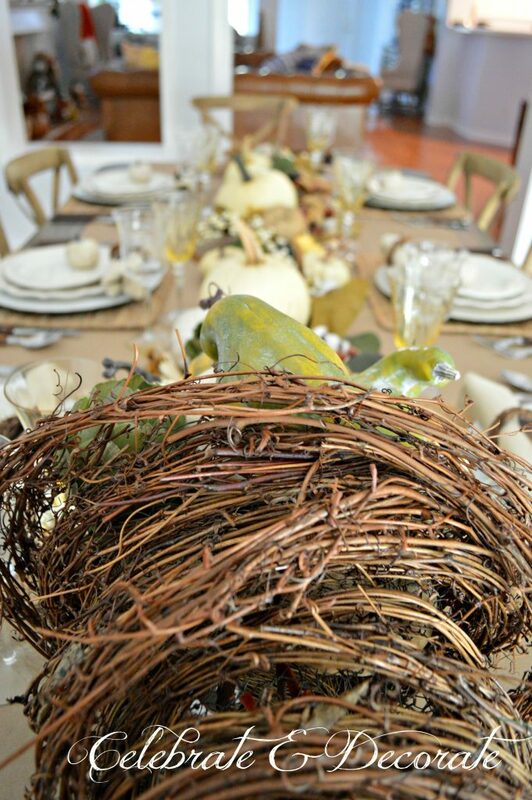 The cornucopia sits at the head of my table elevated on a small grapevine wreath to keep it steady. It is from this cornucopia that my harvest centerpiece flows from. For stemware I selected a fine Bohemian crystal white wine glass that my husband had before we got married (yes nearly 37 years ago) and some pale yellow water glasses. 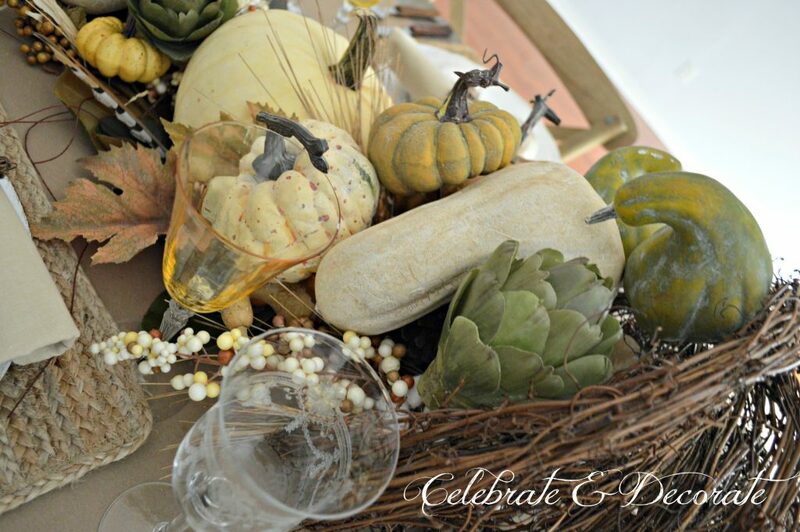 Artichokes, gourds, berries, leaves and feathers tumble out of my grapevine cornucopia. A garland style centerpiece provides everyone with some of the focal point of the centerpiece in front of them and I always serve my Thanksgiving meal in buffet style, so I won’t need space on the table for platters. Oh my goodness! This table is gorgeous! So pretty! 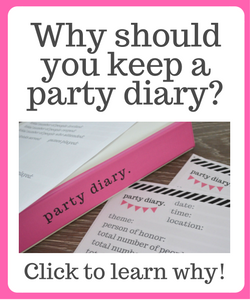 It is fun blog hoppin’ with you this week! Wow! Your tablescape is gorgeous! The centerpiece is just stunning. Great job! This is just beautiful all the way around! Chloe your table looks so wonderful and I love the grapevine crafted cornucopia. The touches of fall are just gorgeous. Have a wonderful holiday season sweet friend! Thank you Sabrina! Wishing you a wonderful holiday season also! Don’t work too hard! Can you please come over and do my table now? Oh my goodness…Absolutely Gorgeous!!!!!! Oh my gosh! I LOVE your cornucopia! It’s stunning. Thank you Amy, it was a struggle, but I am so happy with how it turned out! Thank you for sharing this loveliness. Enjoyed very much! Thank you Sandi! I will be ready to sit down and enjoy that meal! 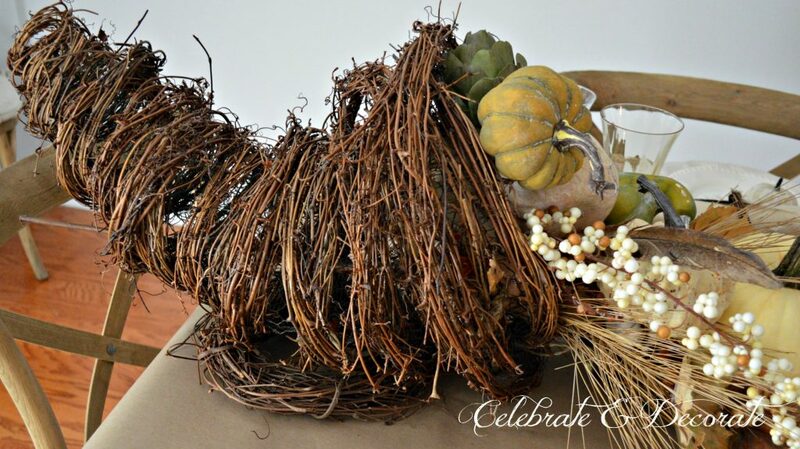 I have always loved cornucopia arrangements, too! Oh, thank you Mary, and yes, even with a chicken wire frame inside (that was hard to wrangle too) the cornucopia was a challenge. Maybe next year I will share a post on how to do it, after I am over the trauma! Those pumpkin plates are so adorable ! 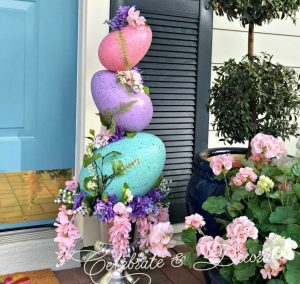 You did a fantastic job – thank you for joining us on this blog hop! That cornucopia is really a sure stopper! It is amazing and so glad you got to make it!! Having the food on a separate table with a setting like this is a must have. So very creative!! 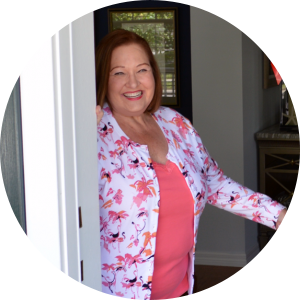 Thank you Zan, I am loving my cornucopia! Wow Chloe – your table is gorgeous. We especially love your centerpiece!! Your white china is a fave too. So fun hopping with you! Chloe, You home and taste is absolutely beautiful. Thanks for inspiring me with all of your pretty details for Thanksgiving. The cornucopia is amazing! I mean, wow! 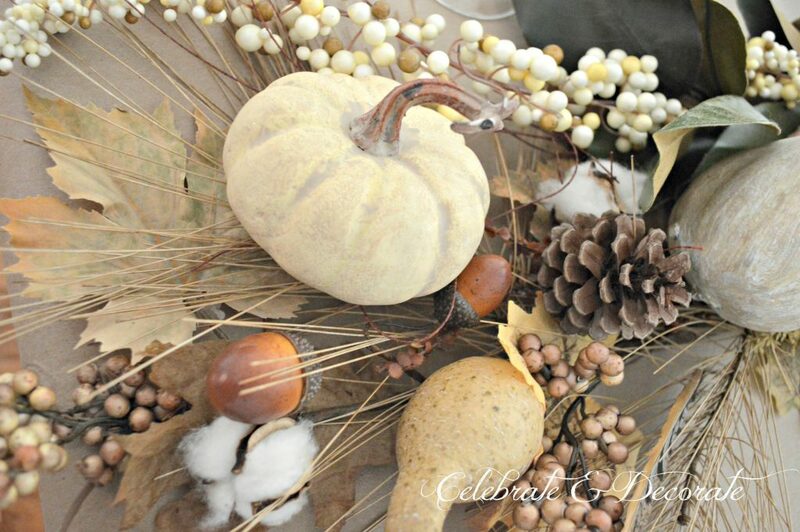 Thanks again for so many beautiful detail ideas that make Thanksgiving even that much better. Beautiful Chloe! I love your overflowing grapevine cornucopia and all the soft muted colors! I have been looking for jute or water hyacinth mats like those, bought some at Target but returned them because they looked dirty when I got them home, yuk! Did you buy them recently? I think there is nothing more perfect for Thanksgiving than a runner abundant with bounty, fabulous! Thank you Jenna. I am not sure if I bought them at Target, but I may have. I have had them for at last a year. A garland as a centerpiece is such a smart idea! 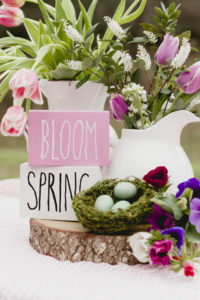 Beautiful table & fun hopping with you! Happy Thanksgiving! Thank you Lora! Happy Thanksgiving to you! Love your cornucopia! The table is dressed elegantly. Love the pumpkin plates as well. Thank you Linda! Happy Thanksgiving to you and your family!